Ulster Academy graduates Alan O'Connor, Dave Shanahan, Ross Kane and Rob Lyttle have signed contract extensions with the province. Dublin natives O'Connor and Shanahan have featured regularly this season, with lock O'Connor captaining the side on several occasions. Kane and Lyttle made their debuts during the 2016-17 season. Ulster have also confirmed that Irish-qualified prop Gareth Milasinovich will join from Worcester in the summer. O'Connor has amassed 81 Ulster caps and has further developed his leadership role within the squad under head coach Dan McFarland this season while Shanahan has shared scrum-half responsibilities with Ireland international John Cooney. The extended deals come less than two years after Lyttle and Kane penned new contracts having earned their place on the senior panel. South African-born Milasinovich, 26, who joined Premiership side Worcester in 2015, qualifies for Ireland through his grandfather and former Ulster player Norman McFarland. The news comes a week after Ulster handed professional contracts to former Academy stars Michael Lowry, James Hume and Eric O'Sullivan. This season, McFarland's first at the helm of the squad, has seen the emergence of a number of young players. 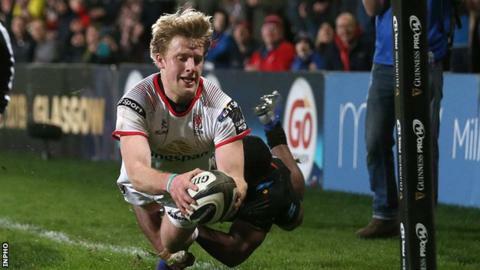 Ulster currently occupy the third and final play-off place in Pro14 Conference B and will travel to Dublin to take on holders Leinster in the European Champions Cup quarter-final next month.